Welcome back for Day 7, the final day of our week of Clint Eastwood movie spotlights! To close things out, let’s talk about another modern success for Eastwood: Gran Torino (2008). 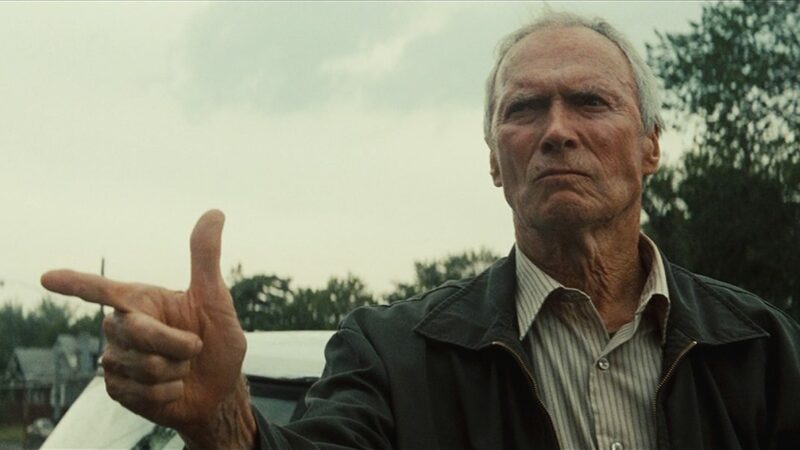 I feel a bit like a broken record this week, but I can’t help myself– these movies have all been great, and Gran Torino is yet another example of Eastwood bringing his A game. Not willing to let Thao waste his potential and throw his life away with the gangs, Walt begins to take the boy under his wing. He teaches him how to fix things, spends time mentoring him, and even helps Thao gain the confidence to ask out a girl he likes. It’s incredibly heartwarming to see Eastwood open himself up to caring about someone again (even if he remains a bit of a craggy old so-and-so). In fact, the journey from Closed-Off Grump to Secretly Tenderhearted Father Figure seems to be one of the defining features of post-2000 Clint Eastwood films…and I love it. Ultimately, Walt finds himself with a difficult decision to make. The neighborhood gang violence reaches a fever pitch when it becomes obvious that Thao has chosen Walt’s friendship over theirs, and Sue is brutally raped and beaten. Walt promises Thao that Sue will be avenged; what form, however, will that justice take? Gran Torino is a complex, richly layered movie, with A+ acting from everyone involved. At times funny, and at times horrifying, the writing and directing really make you feel for these characters. As the credits roll, you hear Clint Eastwood’s gravelly voice whispering the words to the original music behind him, and you know this is a film that will stay with you for a long, long time. Thank you so much for being a part of this special Clint Eastwood Spotlight Series! We hope you’ve enjoyed it as much as we have enjoyed bringing it to you. Be sure to join us again later this month for another Actor/Actress spotlight–who will be next? !